Preface. Acknowledgments. Introduction. Probability Theory and Random Variables. 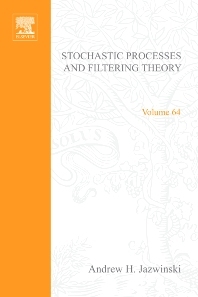 Stochastic Processes. Stochastic Differential Equations. Introduction to Filtering Theory. Nonlinear Filtering Theory. Linear Filtering Theory. Applications of Linear Theory. Approximate Nonlinear Filters. Applications in Reentry. Summary. Appendix 9A Approximate Continuus Filters. Vector Case. Appendix 9B Continuus-Discrete Filters. Vector Case. References. Index. This book presents a unified treatment of linear and nonlinear filtering theory for engineers, with sufficient emphasis on applications to enable the reader to use the theory. The need for this book is twofold. First, although linear estimation theory is relatively well known, it is largely scattered in the journal literature and has not been collected in a single source. Second, available literature on the continuous nonlinear theory is quite esoteric and controversial, and thus inaccessible to engineers uninitiated in measure theory and stochastic differential equations. Furthermore, it is not clear from the available literature whether the nonlinear theory can be applied to practical engineering problems. In attempting to fill the stated needs, the author has retained as much mathematical rigor as he felt was consistent with the prime objective—to explain the theory to engineers. Thus, the author has avoided measure theory in this book by using mean square convergence, on the premise that everyone knows how to average. As a result, the author only requires of the reader background in advanced calculus, theory of ordinary differential equations, and matrix analysis. Graduate students studying engineering or mathematics.